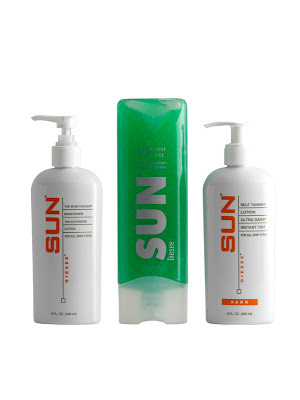 Sun Laboratories is a Private Label and Contract Manufacturer specializing in beauty and personal care. With over 20 years of manufacturing experience, they research, test and produce everything at our Chatsworth, California facility. Sun Laboratories manufactures its own award winning products and was recently rated “Best Self Tanner” by Consumer Reports. They are the first on the market to create a natural looking self-tanner without the orange look or the funky smell. Let's face it. Self tanners sometimes work, sometimes don't. But most of them all have a horrible disgusting smell. Well, this one does not!!! Because it's summer time, I'm always looking for new ways to stay tan without being in the sun, or using a tanning booth. Sun Laboratories specializes in self tanning products, they have so many to choose from! The Ultra Dark Self Tanning Lotion Set ($39.95) provides streak free, non greasy and quick drying application. It will give a deep and long lasting sunless tan, while it nourishes, revitalizes, and hydrates and enhances the elasticity of your skin. Regular use will give a richer and longer lasting sunless glow all year long. Sun Laboratories Sunless Tanning Exfoliant Body Scrub is formulated with natures own vitamins ingredients. This Exfoliating Body scrub gently scrub, cleans and sweeps away dead skin cells leaving your skin moisturized and revitalized, leaving your skin prepared for the ultimate self tanning experience! Begin with Sun Laboratories Sunless Tanning Exfoliant Body Scrub. This whole-body exfoliant uses Apricot kernels to remove surface impurities and damaged skin. Sun Laboratories Tan Maintainer Moisturizer contains special emollients to condition dry skin and help it stay that way... keeping it smooth, soft, and supple. A silky, lightweight cream for hands and body that soaks in easily to leave skin soft and smooth. This lotion has a very light texture and quick absorption on the skin. This is a great gift idea for any occasion! And the best part is? No bad smell! No streaks! And because there is an exfoliator in this package, no dead skin! I have noticed in the past with other tanners, after a couple days it starts to peel off in the form of yucky dead skin. Gross right? Well this self tanner does NOT do that. I think this self tanner set goes above and beyond most self tanners on the market. Finally, a tanner that does what it says it will do, and doesn't give you empty promises. Win: You Can win this gift set by visiting Sun Labs website and telling me another product you would like this summer ! ! ! ! This is mandatory if you wanna win!! Tweeting about this entry once a day will get you one entry every time you tweet!! I like the Tan Overnight with the Best Self Tan lotion. The Roll On Self Tannin Set looks like a great new idea! Would love to try that! Thanks for the giveaway by the way! Following you on google friend connector! Joined Sun Laboratories email list!! I AM subscribed to Bellas Beauty Spot blog! Tweeted about your awesome giveaway! June 8, 2010. I'm sorry I dont know how to put the direct link to it. I havent figured that out yet. I would love to have the TAN MOISTURIZER MAINTAINER! i like the GIFT SET PEAR HAND & BODY SET. Oh this would be so great, I'm paler than a vampire (but my skin doesn't glitter! darn!) I'd try their Strictly Faces Med. Cream. Thanks for the chance to win! I would like the 04.5OZ SPF15 SUN SCREEN LOTION (22003 to encourage my teen to use sunscreen. The AIRBRUSH TANNING SYSTEM KIT sounds cool, for when I don;t have enough time for the self tanner to work. I'd like to try the ICE FINALIZING GEL too. I would also love to try the Fire Maximizer Gel. I am a Sunlab email subscriber as jweezie43[at]gmail[dot]com. I am a Sunlab email subscriber as jweezie43[at]gmail[dot]com #2. Another product I'd like is the PEACH NECTAR HAND & BODY LOTION! id love the GIFT SET RASPBERRY HAND & BODY SET 09OZ! I would also like the LIP BALM SPF15 TUBE. I'd like to try the 09OZ ALOE VERA GEL. You are now following Bella's Beauty Spot"
I'd like to try the "Roll On Self Tanning Set". I would love to try the handy tan airbrush tanning system--very cool. I also like the Tan Moisturizer Retainer so I don't get that blotchy look from my self-tanner wearing off of the dry spots. I would love to have the GIFT BAG 08OZ TAN OVERNIGHT LOTION SET. I'd like to try the Juniper Berry Cleansing gel. Signed up for the Sun Labs email list. I'd also love to try the Juniper Berry gift set. I like the "SUNSCREEN GLITTER GEL"
1. I follow on google friends. 2. I follow on google friends. 1. I signed up for Sun Labs email. 2. I signed up for Sun Labs email. I would love the Strictly Faces Self Tanning Cream. I protect my face with spf 70 all the time, so I would appreciate a way to have a bit of glow of it. I also love the Handy Tan Instant Airbrush Tanning Spray!